I recently bought a copy of Mollie Makes, a magazine I've not bought for some years. Back when it first came out, around the time I started blogging, I used to really love it. I think I had a subscription for it, and I remember making one project a month from it for a year. That was fun. But I started to enjoy it less and less over time; the projects didn't grab me so much, and perhaps my children started to reach an age where I didn't want to make quite so much for them, and I certainly have much less time now than I ever did before, both to read magazines and to make things. But the most recent issue, with it's spring like colours and plant-themed projects, really grabbed me and I spent a long time in the supermarket (once I'd removed all that ridiculous plastic wrapping) flicking through it. I was especially taken with this Boho Botanical supplement, full of gorgeous ideas and really right up my street. This project, a piece of hoop art designed by Helen Wilde of Ovo Bloom, grabbed me straight away. I loved the colours and the contrast between the silky embroidered and spiky crepe paper leaves. I always find satin stitch harder than it looks. It couldn't replicate the perfectly smooth, even texture in the pattern but I did my best. It looks ok. 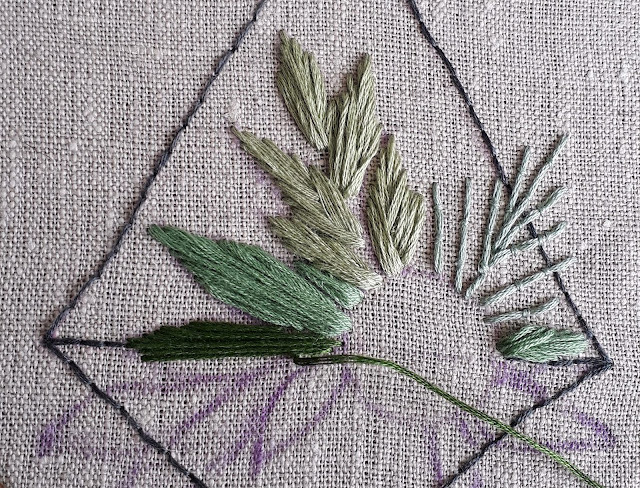 The French knots for the soil were much easier to stitch. I do love a French knot. To create the spiky succulent leaves, you cut small strips of crepe paper, twist them into bows, glue the two leaves together then cut into a leaf shape. Then you slowly layer them onto a small disc of cardboard, about the size of a two pence piece (or wine bottle lid, that's what I used), gluing them down as you go, until you are left with a beautiful, tactile little object. Paper craft isn't something I've ever really experimented with but I can see the appeal. Then the small cardboard disc is glued onto the linen fabric. So simple but very effective. I absolutely love it. It feels like spring might finally come when I look at this. I've hung it in an awkwardly shaped corner in the dining room, next to the book shelves, and I think I'm going to create a hoop wall there. I already have a little pile I've been collecting for a while, piled up there on the bookcase. That will be a lovely job. I saw the project in the magazine and assumed it was some sort of fancy stump work embroidery but what a clever idea to combine it with paper sculpture. It looks lovely. I also thought that it was somehow stitched, you can tell I'm a novice. However it was made it's a masterpiece to be proud of and look at enjoy everyday. Look forward to seeing more hoops. Enjoy your week. More pics of your whippie would be nice but then I'm biased but cannot help myself looking at those beautiful little faces. It is an unusual design and suits your unusually shaped corner very well! Looks lovely but I think a little too far out of my skill mix. Well done looks great. What a fantastic project! It looks lovely on that wall! What a good idea for an unusual shaped area. I agree that satin stitch is harder than it looks. You did an excellent job! I love it and see why you were drawn to it. It makes a lovely addition to your home. I love the samplers you've made over the years of trips you've taken. Beautiful work and very inspiring! It's lovely Gillian & I think I remember a couple of others you've done & would love to see them as a collage on your wall. Take care. Your stitching is exquisite, what a fun make. I love the idea of creating a wall of different hooped embroideries, sometimes it is a challenge to know how to display embroidery without it looking too grannyish (my Midsummer Sprigs is still propped up on a pile of books in my sewing corner of the sitting room). Also the 2D tulip cards! It's just adorable! Great job, Gillian! I saw this too, and bought the magazine purely because of this pattern! Yours looks fab and now I think it might be doable. Thank you for sharing!